The most significant factor affecting run time is battery type. Lithium batteries tend to have the highest capacities. Further, primary (non-rechargeable) batteries tend to offer longer run times than secondary (rechargeable) batteries. For most users, the standard AA alkaline batteries offer a good balance of performance and cost. The major disadvantage of alkaline batteries is that can they leak corrosive fluids, especially when fully discharged. Do not store your computer with alkaline batteries installed for more than 1 or 2 months. Battery life in Table 1 is for medium brightness at room temperature. Ensure your battery type setting is correct when you change batteries. A common mistake is to use the 1.5V Alkaline setting with 1.5V Photo Lithium (Energizer Ultimate Lithium) batteries, or vice-versa. If the setting is wrong, warning levels will occur at the wrong times, leading to shorter than expected life or batteries dying without warning. The display is the major consumer of power in the Perdix and Petrel. The total Perdix system power consumption for various brightness settings is shown in Table 2. The “Auto” brightness setting uses measured ambient light conditions to optimize battery life and readability. In bright sunny conditions, the screen brightness is increased to compete with the sunlight glare. In dark conditions the brightness is reduced to maximize battery life. Longest battery life is about 250 hours using a Saft LS14500 at cave brightness. Cave brightness is a new feature introduced in firmware version 33, created specifically for cave divers with a further reduced brightness. 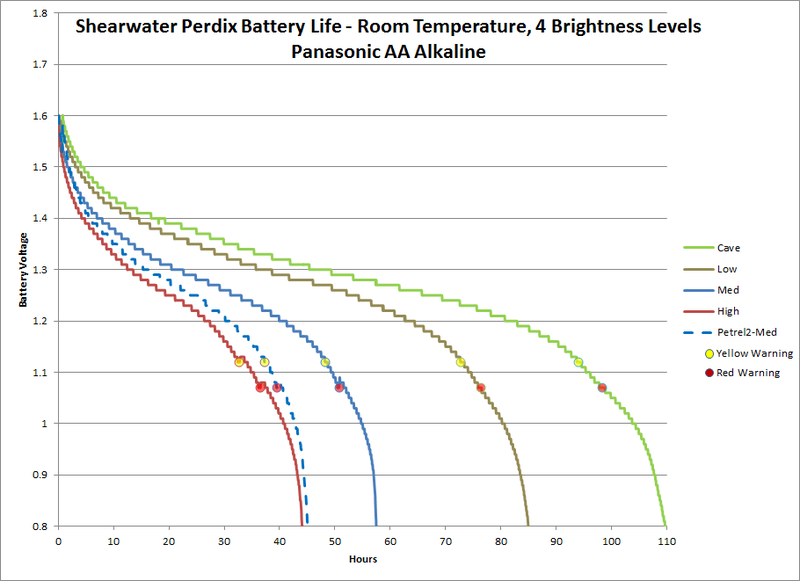 Measured alkaline battery voltage when discharged in a Perdix is shown in Figure 1. The model of dive computer impacts battery life. The Perdix, being a newer model, is about 30% more efficient than the Petrel 2. Table 1 above shows a comparison at medium brightness. The Predator has similar battery life to the Petrel 2, but note that the Predator can only use the Saft LS14500 type battery. In general, batteries perform better in warm conditions than in cold conditions. For example, alkaline batteries have about 75% of their capacity at 0°C as compared to at room temperature (22°C). This drops to about 25% at -20°C. NiMH performance is similar to alkaline. Cold water divers should choose a lithium battery such as the Energizer Ultimate Lithium or Saft LS14500, as these have the best cold weather performance. Lithium batteries retain 95% of their capacity at 0°C and 75% at -20°C. Tyler, this is great news, easy to understand and apply to my diving, the Energizer Lithium look to be the best, another benefit to the longer life is fewer replacements, which means the seal on the battery compartment is less likely to pick up a stray hair and leak. Hi Chauncey, I am glad you found it helpful. The Energizer Ultimate Lithium batteries are a good choice. Pricing is highly variable, but I can often find them for a great price when on sale. Their package claims “8X the life” or something, but this only applies to high-drain uses. For a low-drain use like ours, about 40% more life is available compared to Alkalines. The great thing is that they don’t leak when discharged. I have had the Energizer Ultimate Lithium leak in my computer. The battery went flat and the computer turned off, then 2 weeks later when I opened it up the battery had leaked. You are missing a couple of serious battery drains – the “Wow” factor, and the “Toy” factor. The Wow factor is when someone shows off his or her computer and all the features and logs to everyone they meet. Thanks for the great info. Have you tried any of the above test on the Nerd ? The NERD is about the same as the Petrel, maybe very slightly higher draw for the NERD. The NERD at medium brightness draws about 22mA at 3.3V (73mW). The NERD display backlight doesn’t draw much current, so the brightness setting isn’t as big as a factor. About 20mA at low brightness to 25mA at high brightness. Predator is not really in stock but still very popular and for those a color settings of the display will affect the battery life a little bit because of OLED pixels combination more consuming versus plain RGB colors, I guess. Hi Ol, You are right. For the Predator with its OLED screen, the current draw depends on what is displayed. At 3.3V on medium brightness, the draw is normally about 20mA. But if displaying three 3 O2 sensors, and all are red (low or high PPO2), and red and yellow warnings are flashing, it could peak as high as 35mA. The title colour also has a bit of an impact as well, but it is minor. The green OLED is more efficient so green titles use a bit less power than cyan or blue. Blue is the lowest efficiency, but the difference is only about a 5% impact on battery life when comparing blue titles to green. I want to become one of your dealers in Russia. I understand that in Russia there are already your some representatives. Russia rather big country and therefore I want to develop your brand for territories of Russia. I am an instructor of CMAS, TDI and I can intelligibly explain to people with what Shearwater differs from other underwater computers. And on how many his advantages in front of other computers are big. At present I form the website and is ready to consider your wishes for more successful placement of production of Shearwater. Please send your enquiry to our info@shearwater.com email address. Someone will reply to you from there. Hi YQ, I have not personally tried the LiFePO4 battery type. For looking at the specifications, it should work fine if you can get a 14500 size. One issue is that there is not a “Battery Type” setting for this chemistry, so a proper gauge and warning levels will not be available. I would try the “3.6V Saft” battery type setting when using the LiFePO4, and see if it gives reasonable results. I had read your topic and all the infos, thx for that. I have a little question cause I must change my battery inside my Petrel : The cost/hour between SAFT and Energizer Li is the same and it’s not really important, but what are the differences between both in quality. The Petrel can be used with 3,6 or 1,5, but what’s the best choice ?